I was very satisfied with MCON’s interim statement. The figures showed impressive advances to revenue and profit, and I am hopeful the business can now sustain its much improved trading following a few years of more subdued progress. Upbeat management comments within March’s annual results and a buoyant Q1 update during April had already signalled this first-half statement would be positive. In the event, the half-year figures revealed revenue up 29% and I was encouraged growth came from “across all revenue categories”. Adjusted for currency movements, revenue advanced 23%. MCON confirmed the top-line progress was almost entirely organic and also claimed the mining sector — to which the group sells most of its drills and bits — “continues to improve”. The revenue improvement led to pre-exceptional operating profit gaining 38%. Despite the impressive revenue advance, MCON’s margin did not increase and therefore should offer room for improvement. The pre-exceptional H1 operating margin of 14% matched last year’s first-half performance and, as I mentioned in my annual results write-up, is not that spectacular for a business that claims its “highest design specifications” and “best manufacturing methods” make it “the driller’s choice worldwide”. Indeed, you may recall MCON’s operating margin was 20%-plus during the boom years of 2011, 2012 and 2013. That said, there are signs that MCON’s margin may be about to recover. Intangible development costs now total €1,126k on the balance sheet, all of which will at some point have to be amortised through the income statement. At present, there is no amortisation charge and the current operating margin is therefore flattered a little. MCON’s H1 cash generation was somewhat better than that witnessed during H1 2016. 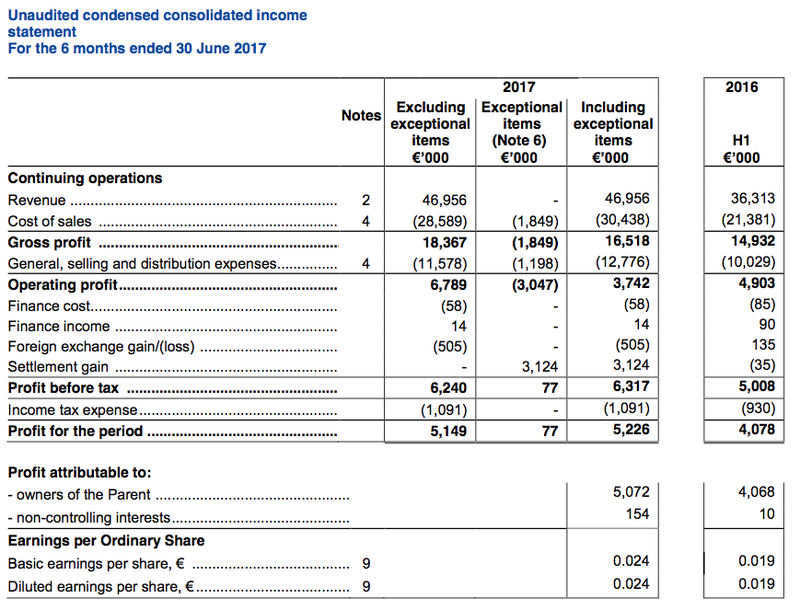 I should add that stock write-offs and bad debts totalling a significant €3,047k were charged as exceptional items to the income statement during the half. I think such items are evidence that past working-capital controls were not as good as they could have been. Capex during the first half was €3,092k, while the associated depreciation charge was only €1,362k. 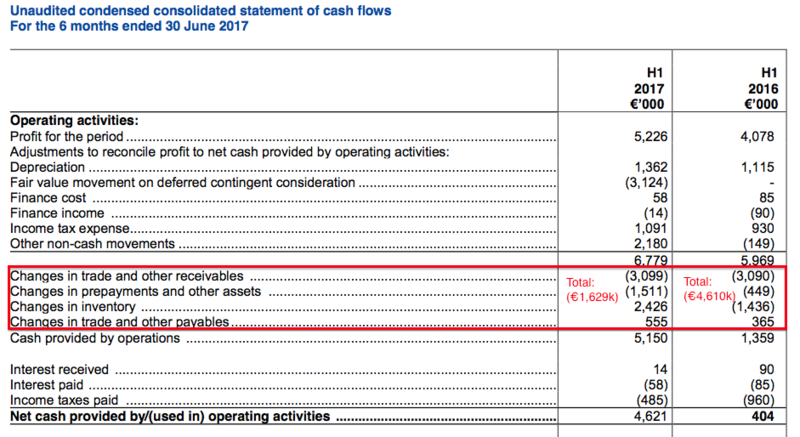 The €1,730k difference is significant when operating profit was €6,789k, but I don’t feel MCON is deliberately overstating its profit at the moment. Indeed, earlier company statements have referred to an increased capex programme and I see the revenue benefits are starting to filter through. MCON’s balance sheet remains strong. 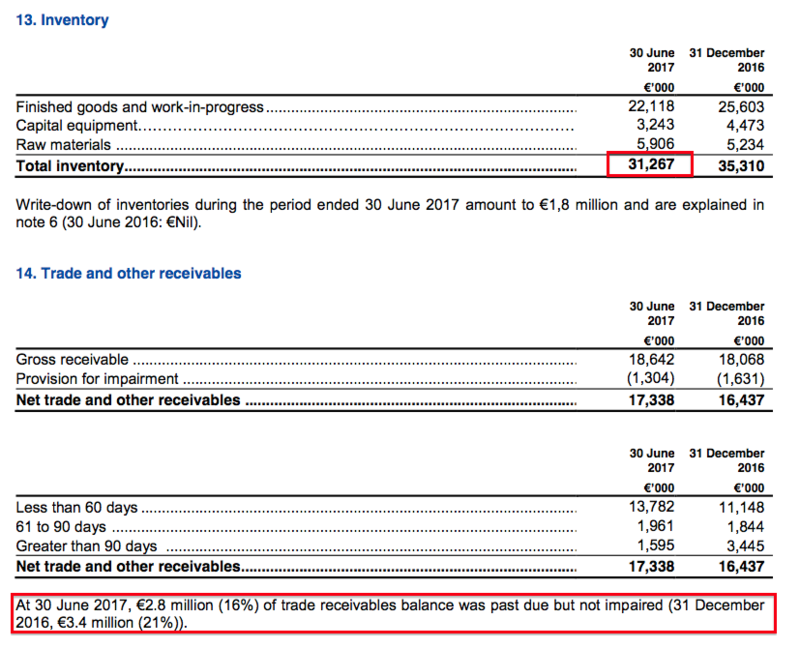 Cash ended the half at €33,701k, which adjusted for loans of €1,344k and deferred-consideration liabilities of €2,256k effectively leaves net cash at €30,101k. Some €2m was spent on an acquisition during H1 and a further €3.2m was spent after the half-year. The sums are not huge and, as acquisition strategies go, I quite like MCON’s focus on smaller, niche manufacturers whose specialist product ranges extend that of the wider group. MCON claimed the three projects ought to come to fruition during the remainder of 2017 and 2018, and reckoned “a reasonable strike rate will deliver meaningful growth and profitability… for the Group”. Anyway, the group’s trailing €12.1m operating profit converts to £11.1m at £:€1.09. Apply the company’s own tax guidance of 17.3% and earnings then come to roughly £9.1m or 4.3p per share. After subtracting the effective €30.1m (£27.6m) net cash position from the £205m market cap, my estimate of MCON’s enterprise value (EV) is £178m or 84p per share. Dividing that 84p per share EV by my 4.3p per share EPS guess gives a multiple of 20 at the present 97.5p mid price. Alternatively, if I extrapolate MCON’s bumper Q2 performance into Q3 and Q4, then 2017 operating profit could be €14.8m or £13.6m, with earnings at about 5.3p per share. The underlying P/E using that EPS guess would drop to 16. I think a possible rating of 16 is quite fair given MCON’s recent progress and the potential for “meaningful growth” should some of the group’s “substantial projects” come good. Finally, the maintained €0.02 per share dividend currently funds a 1.9% income (before Irish withholding taxes for UK-resident investors). Thought I’d just add a few more lines to MCON’s working-capital movements. Inventory is now €31,267k, which compares to between €32m and €35m during 2015 and 2016. So clearly there has been some stock-level improvement during H1 2017, which is quite impressive since revenue during the six months was €10m higher than H1 2016. I am hopeful MCON now has its inventory under more control. That said, stock levels of €31m remain very large compared to revenue currently running at €86m. Further stock reductions would be welcome. With trade receivables, the H1 2017 statement declares 16% of the trade receivables balance was past due but not impaired. The percentage compares to 21% at the end of 2016, so the H1 reduction is good. However, the H1 2017 statement did not refer to the position of H1 2016, when 13% of the trade receivables balance was past due but not impaired. All told, I get the impression MCON still has work to do to improve the efficiency of its collection of outstanding customer invoices. Nonetheless, outstanding H1 2017 trade receivables of €17,338k currently represent 20% of the €86m trailing annual revenue, and compares to 22%, 19% and 22% for financial years 2014, 2015 and 2016 respectively. So the present position simply matches what has been seen during the last few years. Oh dear — I have just realised I missed this Q3 update. The statement was issued on 23 October 2017. At least everything reads quite well. Mincon Group plc (ESM:MIO AIM:MCON), the Irish engineering group specialising in the design, manufacture, sale and servicing of rock drilling tools and associated products, today provides an interim trading update for the period from 1 January 2017 to date, incorporating the first nine months of trading to 30th September, 2017. In the numbers below we exclude the contingent gain and exceptional costs disclosed at the first half reporting. These were broadly neutral for earnings. We had expected that growth would moderate in Q3 this year, as the second half of last year had a higher sales baseline. In fact the growth has been sustained so that revenue for the year continues at a level 29% ahead of last year (26% on a constant currency basis) at the end of Q3, and we are seeing a more favourable mix towards Mincon manufactured products as we move to replace the largest bought-in categories where this offers value to the Group. The acquisition growth is not very significant in 2017, so the great majority of the growth is organic. We are seeing growth across all the business units and territories, save for South America where the loss of a key customer delivered a set-back at the end of last year. Africa has been strong, as has Northern Europe and the USA. The reorganization of Mincon Australia Group at the start of the year, and their beta testing of the new range for 2018, has great potential on top of their existing growth. Overall we are satisfied with the continued progress on revenue in the third quarter. Our Mincon Nordic hub has been a key area of investment for the Group this year. The hub now comprises the Viqing drillpipe factory, Mincon PPV, our business that addresses the markets for piling, construction and tunneling, and the new team for managing Mincon product sales in the region, both directly and indirectly. acquired, while continuing to build external customers. We are developing an investment plan for that business to treble the turnover as quickly as is commercially sensible. The business has stepped up to three shifts already, recruited some new people, and is working with Group to develop the team and the capital investment path. The market for the Mincon PPV products is mainly large scale projects extending over years, such as tunnels, piers, and foundations. We did not take on any projects in progress upon acquisition, so we have a time gap before we win new work, and the costs associated with that. We are currently selling some lower margin smaller product into established accounts. We are also now quoting across our sales network for a number of live projects, any one of which will be a substantial launch for the business to our Group. We are confident in the company, the products and the team. We are staffing up the Tampere regional hub through the recruitment of experienced senior personnel, and expensing the start-up costs of the Mincon Nordic strategy. The losses this year are just over €750,000. While it is early days, we expect the sales run rate to approach €10 million on an annualized basis and, as we said at the half year, expect Mincon Nordic to move into profitability in 2018. The mix of the start-up businesses with the existing sales network has brought down the gross margin a couple of per cent, but this should improve over time as the new businesses come up to expected volumes. In general, businesses have been moving inventory faster than expected and reordering more than planned in our production schedules, commensurate with the rate of growth. This sustained demand is now having to be planned into further capacity increases in the core factories. While we have increased capacity through the downturn, this market share growth is beyond what we had anticipated. We are accelerating our systems development roll-out to improve communication in the Group. We will also be reviewing margins in the context of this order strength. Excluding the Mincon Nordic start-up costs, the operating profit margin is 1.4% ahead of 2016 at 15.7% compared to 14.3% for the same period in 2016. We have an adverse foreign exchange charge of €844,000 in the first nine months compared to a gain of €785,000 for the same period last year which explains the change in the profit before tax. Work to mitigate the foreign exchange volatility continues. We successfully designed and manufactured the larger size of hammer requested by our development customer in Australia, and it has delivered some very encouraging early results. The project is managed by our own team on our own development rig on the customer site. We are analysing the results, and breaking down the product to see what modifications may be required to ensure the performance and longevity of the products in the range. This will continue through the rest of the year, as previously flagged, with capitalised expenditure at the end of Q3 rising to €936,000. The rest of the research and development expenditure on extending and improving our ranges has been expensed, in keeping with our policies on those project categories. The Group continues to have a strong balance sheet with €28.5 million of net cash after capital expenditure of €4.7 million, an acquisition spend of €5.6 million, and dividends of €4.2 million in the first nine months of this year. Working capital has fallen by several million euro even as sales have risen by 29%. We believe this is the new sustainable sales baseline and as a result we will revisit our production capacities in the upcoming three year plan to reset inventories to support this new trading level. Since availability of product plays a key role in sales we will need to rebuild the faster moving inventory to levels that satisfy the current needs of our customers. Our large hammer strategy is on hold while the plant we acquired to manufacture them has been applied to supporting existing ranges, or to meet the development requirements of the new product range being beta tested in Australia. The operating margin growth to 15.7% for the first nine months, excluding the Nordic region start- up, is demonstrating the operational gearing in the Group, as we track the conversion of the gross margin to the operating profit line. We believe there is potential for additional margin gains if we can recreate the dynamic equilibrium between our production and sales over 2018 to improve efficiency scheduling and delivery. Part of that is rolling out the scheduling and ordering systems currently in planning, and this is a core objective for the coming year. We may have to expand capacity again and to consider the balance of advantage on where products are manufactured, not to cheaper production locations, but to be closer to customers while continuing to improve the quality associated with the Mincon name. To that end the Executive has been tasked by the Board with the development of a rolling three year plan, in a process that is ongoing. The sector continues to make a broad based recovery, as can be seen by the results of the market leaders. We are producing and selling beyond our optimum levels at present and delivering those products in some cases uneconomically in order to maintain a high level of service to customers. That is acceptable in the short term as we come out of the sector downturn, and it is clear that we have the products to sell, and both the customer base and markets in which to sell and that these provide an excellent platform for the next phase of growth. What we need to do now is plan what our new production levels should be to continue to build margins, quality and service delivery through this sector upturn. The planning we are engaged in over the next three and six months will be key to the performance of our business in this next phase. With this rate of organic sales growth, and the underlying operating profit improvement, the Group is in a very strong trading and cash position for the future.